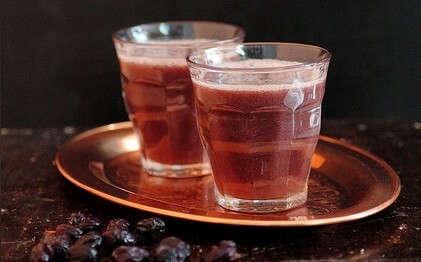 Kishmish Ab is a raisin drink commonly made in Ramadan. It is not necessary to add any sugar to this drink, although some people do but I find it sweet enough and one can adjust more concentrated juice according to their taste or thin it out with some water. Wash the raisins well and place in a glass pitcher or bowl. Add water to cover by about 1 inch. Leave in a cool place or in the refrigerator for 2 to 3 days until the juice is sweet, stirring from time to time. Serve the raisins with plenty of juice in individual glasses.